Easy instructions for this Shrek birthday cake idea: Bake a sheet cake the size that you need. 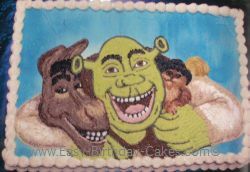 This Shrek birthday cake idea is going to have three characters from the movie on it. Ice the cake in buttercream icing making sure that the surface is nice and smooth. Let it dry for about one hour. I used the parchment paper transfer method to put the design on the cake surface. Spray the background with blue color mist food color spray. Let the color dry before proceeding. To do the cat use the star tip, size #14 for the fill in work and round tip, size #3 for the line work. You will fill in all of the colors first. Outline the eyes first in black. Using the same size round itp fill in the center of the eyes with yellow icing. Next make a small black dot in the center of the eye. Using a toothpick, pull the dot from the center to the top and bottom of the eye. You should have a pointed oval shape in the center of the eye. Next using a light tan icing, fill in the muzzle and chin area and also the chest and paw. Next using a dark brown, and medium brown and an orange brown, fill in the rest of the cat. The nose and mouth lines are done in dark brown. Blend the icing colors with a toothpick. make the whisker lines with tan icing. His hat is outlined in black and filled in with a black icing made just a little bit lighter. The feather plume is done in yellow and orange icing and blended with a toothpick. Now you will move on the Donkey. You will use the round tip, size #5 for outline work and the star tip, size #18 for fill in work. first outline the teeth in black icing. also fill in the background of the mouth in black. Next fill in the teeth with white icing. Outline the eyes in black. Next fill in the teeth with white icing. Outline the eyes in black. Fill in the pupils with brown and fill in the rest of the eyes with white. Using the picture as a guide fill in the rest of Donkey's head and ears using light tan, light brown and dark brown icing colors. Blend the colors using a small fork. Still using your star tip and black icing fill in the eyebrows and the mane on the top of his head. Next we will do Shrek. You will use round tip, size #5 to do all fo the outline work and the star tip, size #18 to do the fill in work. Using black icing, outline the teeth in black. Fill in the teeth with white icing. Make a dark olive green icing and outline Shrek's face and hands. Also fill in the centers of the ears. Next, fill in the bottom lip with pink icing, also the tongue. Fill in the background of the mouth with dark brown icing. Now do the eyes filling in the pupils with dark brown with a black dot for the center. Use white icing to fill in the rest of the eyes. Fill in the face, neck and hands with a yellow green icing. Fill in his vest with a dark brown icing. His arms are filled in with white and tan icing with the creases of th arms outlined in medium brown icing. Use a fork to blend the colors on the arms. Use a star tip, size #32 and make a shell border on the top and bottom edges of the sides fo the cake. This is a great birthday cake idea for a child who likes Shrek.